The same house 12 years ago - Roof tiles have been renovated while the tree on the left has grown up by about 1m. 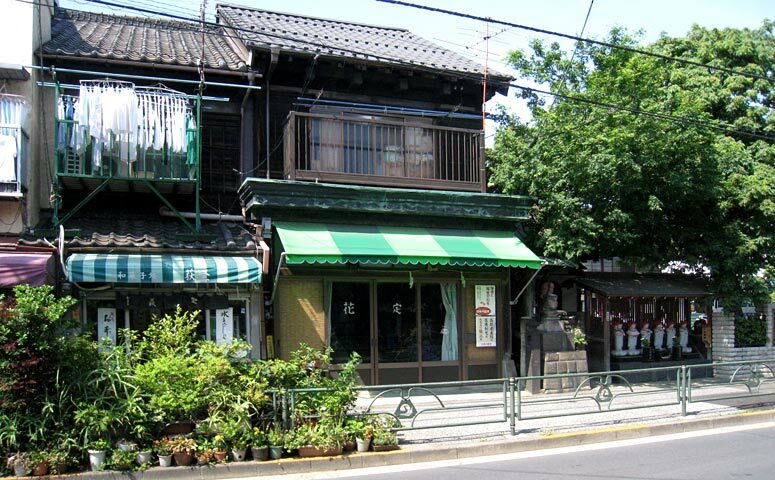 I would like to write my second report on Yanaka nearly 12 years after my first report. Though I find there some new elements, Yanaka has not changed in its essence. Many things are changing rapidly in Tokyo. 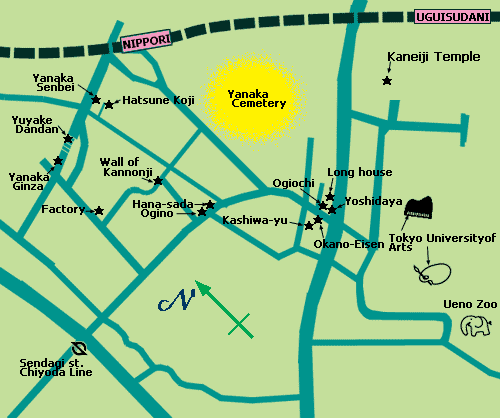 However, Yanaka is one of the constant factors in the changing environment. Needless to say, this miracle has occurred thanks to the activities of the local volunteers initiated by Ms. Mayumi Mori. They have succeeded in establishing Yanesen(*) as a "brand" where visitors can experience the atmosphere of an unspoilt, traditional urban quarter. 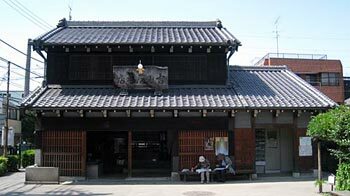 A word made from the first syllables of the three districts in the area, namely Yanaka, Nezu and Sendagi. Today, I started my short tour from JR Ueno Station. The western side of JR Ueno Station is a traditional center of cultural life in Tokyo. There are amongst others six museums, a zoo, a music hall and Tokyo University of the Arts. Members of the militant group "Shogitai" were later buried together on top of the Ueno hill. 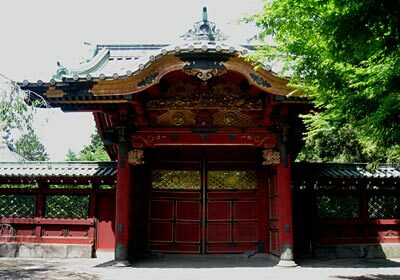 During the Edo period (1603-1867) the whole area of Ueno Hill belonged to the powerful Kaneiji Temple and six of the 15 shoguns of the Tokugawa shogunate are buried in its temple yard. Most of its buildings were destroyed in July 1868 during the armed conflict between a remaining militant group of samurais and the Imperial army. 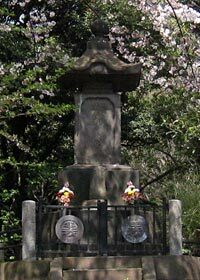 However, the shogun graves still exist in the backyard of the Tokyo National Museum. Unfortunately, the grave area is nowadays closed for visitors. It was originally built by the fifth shogun Tsunayoshi, and while many buildings were pulled down or destroyed during the course of time, the gate "Chokugakumon" (1709) remains undamaged with a plaque directly written by the Emperor of the time. It makes you smile to see that people recently decided to erect an informational board for a lady who is buried here - Atsuhime, the official wife of the 13th shogun Iesada. She played an important role in achieving the bloodless capitulation of Edo - capital of the Edo shogunate and present Tokyo. Many Japanese people made her acquaintance for the first time last year, because she became the heroin of an NHK TV saga that lasted a whole year. An informational board containing historical detail was then hastily erected, while no board exists for six shoguns. 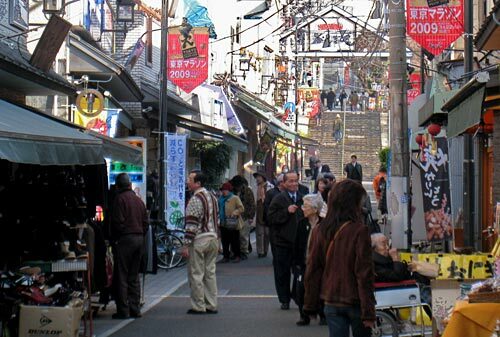 While Ueno represents the official life of Tokyo, we can see the life of ordinary people in Yanaka. The area escaped the ravages of Great Kanto earthquake in 1923 and air raids in 1945 and the local people tried to keep the tradition as I explained above. 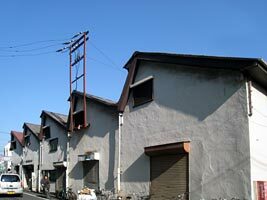 Therefore, we can still find many old houses and buildings. However, we should not overestimate the age of the wooden buildings. We used to build houses and other smaller buildings till the early 1960s with the traditional building materials and style. It was also usual to rebuild private houses after only a few decades, if people could afford it. 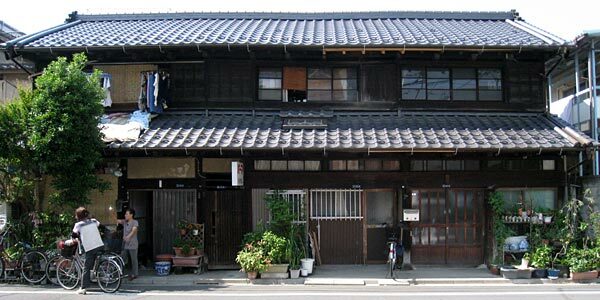 Therefore, generally speaking even old looking wooden houses in Yanaka cannot be very old. I guess that most of them were built in the early 20th century. Some very old houses might have been built in the mid 19th century. 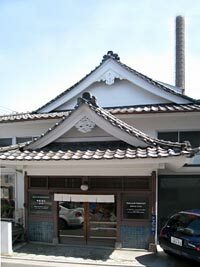 For example, this former sake shop, now used as tourist information center, was built in 1910 and keeps well the characteristics of shop buildings in the 19th century. 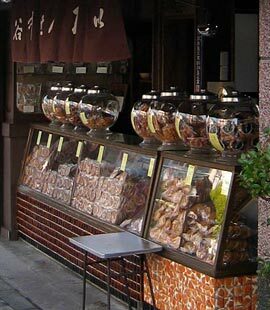 In its neighborhood "Okano-Eisen" is a Japanese confectionery shop. It opened in 1900, but the building looks newer. There is a long house not far from those two buildings. It looks as though it has been renovated in the meantime, like many other old buildings in this district. With new roof tiles the building looks much newer than before. "Ogiochi" is the name of this old-fashioned teahouse as well as a sweet dessert which is made of o-gio fruits growing in Taiwan and served in this house. I have never tried it, though I am curious about it. Yanaka is a town with many temples. Ordinary houses stand between large temple yards. 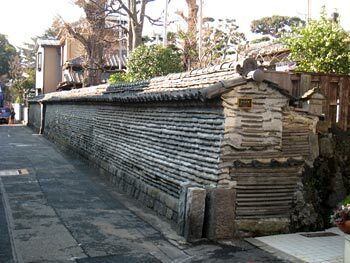 In the early time of the Japanese modernization, the Meiji Period (1868-1912), some intellectuals such as Ogai Mori and Tenshin Okakura, made Yanaka or Nezu their base for creative activities, because the area was not far from the academic center of Tokyo, namely Kanda and Ueno. However, as the time went on, many intellectuals moved westwards and the Yanesen became nothing but just an old district till people started to pay attention to its oldness. Therefore, even now, Yanesen is not a town of intellectuals or rich people but of simple manual laborers. This characteristic is somewhat common to Katsushika-Shibamata, an east-end district of Tokyo, where a famous film series of "Otoko wa tsurai yo" (It's tough being a man) was shot. We call such a district "shitamachi". My dictionary says that the English translation of "shitamachi" is "lower town". However, I don't think that "lower town" exactly corresponds to "shitamachi". "Shitamachi" is an old residential and commercial quarter. People know each other and there is an intimate community similar to that in a village. 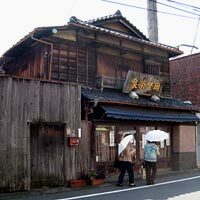 At the same time, there is a nuance that "shitamachi" is somewhat old fashioned and people are not rich and modern. Yanaka Ginza exactly matches our idea of shitamachi. Coming from JR Nippori Station, we first look down at a narrow shopping street from the top of a flight of stone steps. The steps are called "Yuuyake dandan". "Yuuyake" means "red sky at sunset" and "dandan" is a baby talk for "stair". Yuuyake dandan is the nickname of the steps and introduced in 1990 after the idea of Ms. Mayumi Mori. 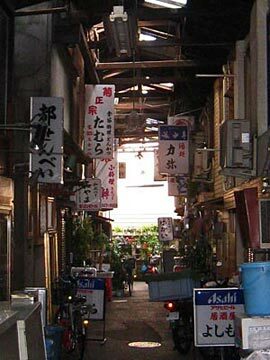 Shopping streets in shitamachi are in many cases not flourishing as before. Many shops go bankrupt in face of competition with big capital ventures such as supermarkets and department stores. As many shops are permanently closed with steel shutters, so-called "shutter streets" are spreading over the whole country. But, Yanaka Ginza is different. We still feel the energy of local people and their shops are flourishing. 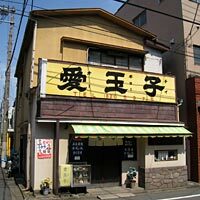 On the other hand, because of many outsiders Yanaka has been changing. Galleries and chic tea houses are mushrooming and many of the people strolling on the streets are mere outsiders and spectators of the town life. I hope that Yanaka will not lose its vitality. I hope it will not become a sort of open air museum where the real life has disappeared.